band is too tight, not tight enough. is it when I am aero or sitting up? Does my skin get bunched up? For a while I was paranoid that something was wrong with me, and I'd take my pulse just to be sure. Now I try a few clothing or position adjustments, but mostly try not to let the data distract me from the job. The monitor I used today I'd been using on the bike trainer and I had been gaining confidence that it was pretty reliable. Until today, out in the elements. Other than the data issue, it was a pretty good ride despite being in the mid-30s with something freezing pelting me at the very end. This was one of my favorite routes but they tar-and-chipped a big section of it last fall and it's rough and slow now. It's still beautiful with creeks, farms, animals, and many opportunities to play guess-the-roadkill. Love the names - "Half Acre of Rocks" etc. Typical elevation chart in the Blue Ridge Mountains!! 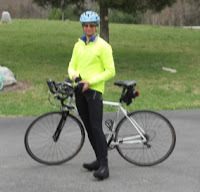 Is this any way to have to dress for a late MARCH bike ride? !